In the early days of its existence, decorators and their suppliers were the main customers for Dulux, with Say Dulux to your decorator used as an advertising slogan in the 1950s. By 1953, Dulux was available in the retail market and ten years later the famous Old English Sheepdog was used in advertisements, to the point where “Dulux dog” has become a common nickname for the breed. The name Dulux is derived from the words DuPont and Luxury. 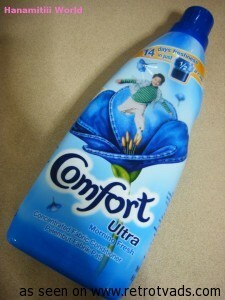 Comfort was the first fabric softener to be launched in the UK in 1969. Today Comfort is a global brand, operating in Europe, Asia, Latin America and the Middle East. 1984 saw the launch of the first concentrated fabric softener for Comfort, which was three times more concentrated than regular fabric conditioner. In the 1990s, the Comfort brand went through a number of changes: a new logo and more modern packaging in 1992 and the first fully biodegradable formulation in 1993. In 1998, Comfort replaced cartons with more environmentally-friendly and lightweight crushable bottles, introduced their first hypoallergenic fabric conditioner and launched tumble dryer sheets. Mr. Sheen is a brand of cleaning materials (chiefly floor and furniture polish) created in Australia in the 1950s by Samuel Taylor Pty Ltd. It was the first aerosol cleaning product available on the Australian market and helped introduce the use of aerosol products into Australia. The product moved to a British company Reckitt & Colman in 1969 when Samuel Taylor Pty Ltd was bought out. It is available in many other countries around the world, including the United Kingdom, South Africa, Zimbabwe, and Jamaica. The Australian Television advertisements use the character of Mr. Sheen, a smiling, rosy-cheeked, bald man with spectacles in a dark suit. The British version is a cartoon caricature of aWWI biplane pilot (originally voiced by Willie Rushton) who flies around the house on a dusting cloth cleaning tables, banisters and television sets, using the slogan “Mr Sheen shines umpteen things clean”. 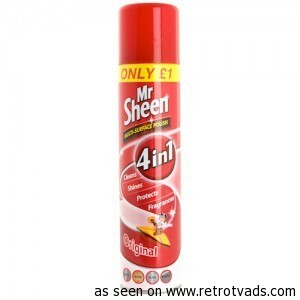 Another slogan (sung as a jingle) was “Clean wax and polish as you dust with Mr. Sheen”. This jingle was patterned on the famous vaudeville song/sketch Mister Gallagher and Mister Shean; while it is likely the name Mr Sheen was also inspired by this song, and the fortuitous connection between sheen and cleanliness, it is unknown at this point whether there is a causal connection or not. Quinnsworth was founded by Pat Quinn in 1966 and was sold to Powers Supermarkets Limited in the 1970s. During the 1970s, the slogan used was “Let’s get it all together at Quinnsworth”. Powers Supermarkets Limited was the parent company, but used Quinnsworth as its marketing name. The company became a wholly owned subsidiary of Associated British Foods plc. And run by supermarket executive Don Tidey. In Quinnsworth’s final years, Yellow Pack was replaced by Premium Choice as the own brand. 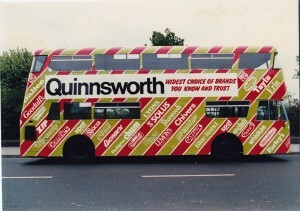 Quinnsworth was remembered for its advertising campaigns featuring its marketing director Maurice Pratt (later became chief executive of Tesco Ireland), who would personally introduce new product promotions, ending each advert with the company slogan, “That’s Real Value”. 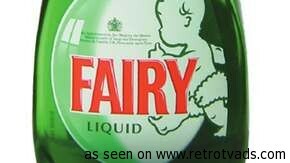 Fairy is a brand of washing-up liquid produced by Procter & Gamble at their West Thurrock factory (The London Plant), England. Fairy liquid is traditionally green, prompting the well-known advertising jingle “Now hands that do dishes can feel soft as your face, with mild green Fairy Liquid”. As of 2008, Fairy is sold in most parts of Europe, although regional names vary. Fairy liquid is available in a variety of colour and scent combinations. The iconic white bottle with red cap was replaced with PET bottles. Outside the UK, the products are a part of the Dreft brand.